For a unique and delicious alternative to dyed eggs that are mainly used as decorations, try pickling eggs. When peeled hard-boiled eggs are left to soak in flavorful and colorful pickling brines, they become beautifully colored and wonderfully delicious. 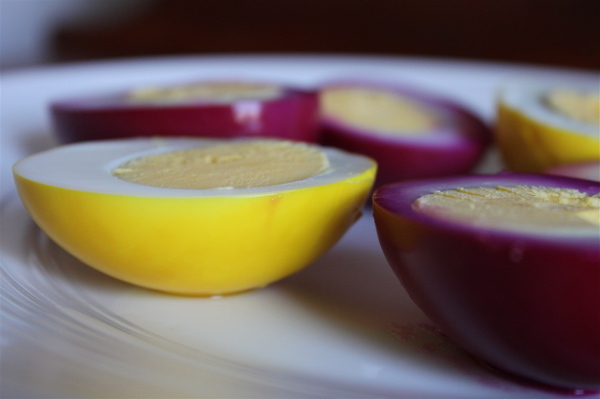 Usually thought of as a popular bar food, pickled eggs can add vibrancy and pizzazz to salads and sandwiches or serve as an interesting accompaniment to fish and chips. Or, switch up your Easter egg dyeing tradition and serve these on a festive holiday appetizer platter. The beet juice and turmeric brines work quickly to turn the eggs a bright magenta or yellow color. The jalapeno brine will impart a much more subtle color, but will make up for the lack of color in the flavor department. For lightly pickled eggs, leave the eggs to soak refrigerated in your brine of choice overnight. 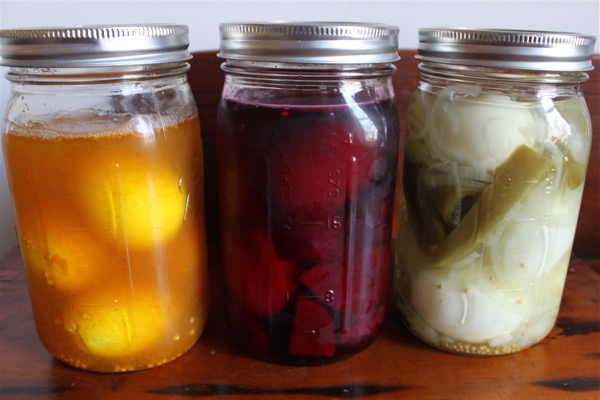 For more pungently pickled eggs, leave the eggs refrigerated in the brine for up to two weeks. The longer the eggs sit in the brine, the deeper the color will penetrate into the egg. Cut the peeled beets into 1/2-inch cubes. Bring the water to a boil in a small saucepan and simmer the beets, covered, for 35 minutes or until they are tender. Using a slotted spoon, remove the beets from the beet water and set aside. Add the vinegar, sugar, peppercorn and salt and simmer until the sugar has completely dissolved. Place the eggs and beets in a clean quart sized jar and pour the beet brine over the eggs. Cover the jar and store in the refrigerator. Bring the vinegar and water to a boil in a small saucepan. Stir in the mustard seeds, turmeric, sugar and salt and simmer until the sugar has dissolved. Place the eggs in a clean quart sized jar and pour the mustard turmeric brine over the eggs. Cover the jar and store in the refrigerator. Bring the vinegar and water to a boil in a small saucepan. Stir in the jalapeno pepper, sliced onion, garlic cloves, sugar, mustard seeds and peppercorns. Simmer until the sugar has completely dissolved. Place the eggs in a clean quart sized jar. Scoop the peppers, onions and garlic into the jar with the eggs and pour the brining liquid over everything. Cover the jar and store in the refrigerator.